Solid walls and a lack of electricity can make time in a hexayurt a pretty dark experience. Sure, you can cut a window or two, but that means you have to deal with dust and insects. A bottlebulb is a great solution for bringing light in during the day. 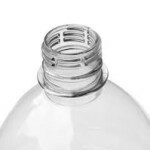 A bottlebulb is nothing but a clear plastic soda bottle filled with water and a little bleach. Instructables.com has detailed instructions for making one, but there really isn’t much to it.